Rode with the GPS today in my cell phone holder which is on the shoulder straps of my camel and I think at one point is slipped down to the sternum strap and I lost signal. Hence, no map today but it doesn't matter because I only had time for a quickie. Riding in the snow was increadibly tough because this snow was very wet and about 5 inches deep. Great traction and also great for snowballs, but horrible to peddle in. That was a nice workout for lunch, though, that leftover pizza I had fueled me nicely. Later in the day, I drove up to Middletown to attend my monthly CT New England Mountain Biking club meeting. If you recall, at the January meeting I volunteered to be the Membership coordinator. I wrote a nifty little database using MS Access to track the memberships and pull statistics monthly. Tonight, I was officially voted in as a board of director. It looks like we will be going forward with my membership postcard idea. That is a 4x6 laminated postcard with CT NEMBA contact information that is to be handed out to people seen mountain biking who are most likely non-members and put on car windshields at popular mountain biking destinations. 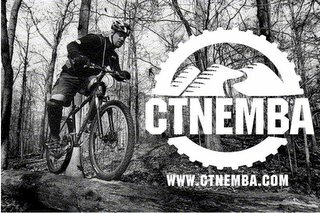 Hopefully this will attract more people to visit our CT NEMBA website and hopefully join the club and get involved. The picture is of Deeman from Crankfire.com riding a log at Huntington SP. The picture was taken by Mike Marques, a professional photographer and avid mountain biker. I keep asking him when is he going to put out a coffee table book of all of his pictures because they are awesome! Congratulations Mark! Sounds like your doing a great job on the CT NEMBA board. Great idea for the lamenated postcards. Always good to get the word out there. I'm in your MS Access database, somewhere. Usually around this time I get my renewal mailing. hehe. I'd like to link your blog - let me know if this is cool with you.